Recent research has shown that, unfortunately, many people are more willing to pay extra money on their monthly bills for various amenities, without being open to how home automation can help them save money. This is perhaps understandable, given that up until recently home automation was the purvey of TV lifts and other gadgets which were designed (particularly by linear actuator manufacturers) to increase the amount that could be done within a home with the use of linear actuators to raise and lower chairs, desks, TV consoles, and other simple things of that nature. Houses which can be classified as smart homes are still few and far between, which is perhaps why most people are still unaware of what exactly home automation can do to help them save money on their monthly utilities. The use of thermostats, lights, and various remotely controlled appliances means that the homeowner can exert greater control over their surroundings even when they are not there. The first reason for people to invest in home automation systems is that they are themselves becoming more affordable over time. Not every homeowner will be able to afford the latest technology on offer, but all home automation is good, as it allows for circumstances in the home to change, whether that is through the use of a new Smart thermostat being used to more accurately control the temperature and the hot water, therefore potentially saving money both through the greater control people have over their heating, and also through the updating of the system itself. Whether it is related to the overall updating of the system, or whether it is simply due to remote and mobile device control over said systems, automated systems perform better than unautomated ones. Automated systems are computer controlled, and the system when put in place functions much more effectively than other systems. Not only does the remote activation mean that it responds much more easily to commands (even when those commands are given remotely), allowing for greater control on the part of the homeowner, the system itself is quite often more easy to use, leading to better performance overall because of fewer mistakes being made in operating it. This may seem obvious, but home automation can help homeowners to save money because it saves energy overall. Without home automation, homeowners need to rely on timers and their own memories to save energy. The remote control ability which most home automation offers means that memory and timers are no longer the only options on offer. Where before a light forgotten was one which continued to shine until someone managed to come home and switch it off, automated technology means that lights can be turned off from some distance away, or even programmed to turn off automatically at a given time during the day. The same can be said of heating – rather than setting a timer and praying that no one will have to work late, the heating can be switched on or off while the homeowner is away, meaning lots of saved energy. Home automation is currently one of the best ways for people to save money on their monthly bills, for a number of reasons. The technology is becoming cheaper overall, and easier to use (particularly now that is it becoming integrated with existing mobile technology). 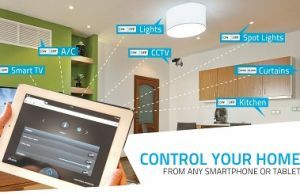 The use of home automation is something which can save homeowners a lot of money in the long run.